Pros- It is an energy star appliance. Hence it saves electricity. The dryer is very efficient . It has a lot of options one can customise. 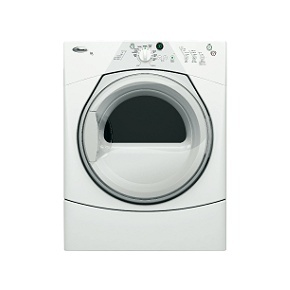 It has the regular stuff most dryers have plus it also has a quick dry option and a timed drying option wherein we can set the amount of time we want the dryer to run. It also has an option where one can have the clothes more dry than normal. It has a wrinkle shield option which protects clothes from getting wrinkled up. Cons- The dryer is made of heavy duty material. which is good , but usually I find the door pretty hard to open and close. I have to literally yank it open & close with much force. The tub inside the dryer is stainless steel and sometimes it gets very noisy if there are clothes with metal buttons or zippers. I will rate it a 5. it is the best in it's class.